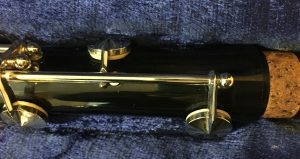 What to send if you need Help identifying your Clarinet. 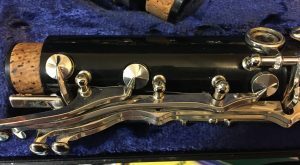 I’ll get many email from people wanting to know what brand and model clarinet they have. In order to assist I need to see detailed pictures of the clarinet. “Detailed” means up close, really close and at specific angles. 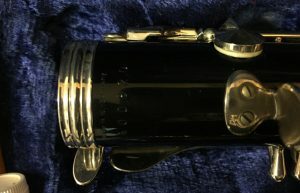 Taking a photo of the entire clarinet does nothing other than help me identify it as a clarinet. Thus the picture have to be upclose. The below photos are *exactly* what I need to see if you want to send me an email asking for assistance. 1 – UPPER JOINT, Upper Half – This picture should show the (a) Emblem (b) upper throat keys, and (c) trill key guide. 2 – UPPER JOINT, Lower Half – This picture shows the (a) lower keystack, and also the (b) shape of the trill keys and (c) the bridge key. 3 – UPPER JOINT, back of upper half at a *specific* angle. This picture shows the (a) register vent (which varies and may be tall or shorter) and also the (b) shape of the trill key guide. 4 – UPPER JOINT, Lower back half. This picture shows the (a) trill keys and their shape and how many (b) posts they may or may not share. I also shows the (c) shape of the bridge key. 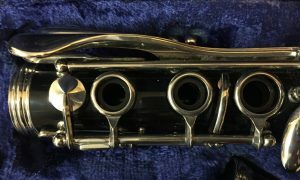 5 – LOWER JOINT, upper half – this picture shows the (a) upper top key and it’s shape (very important for french clarinets); (b) shapes of the sliver key; (c) and the shape of the left hand pinky keys. 6 – LOWER JOINT, lower half – if taken at an angle it will show (a) spring configuration; (b) lower emblem [if there is one]; (c) key design. 8 – ANY SERIAL NUMBER. Normally found on the upper and lower joint. 9 – Picture of Bell with emblem. Bells are often replaced. A picture of a bell with emblem will tell me practically nothing about the rest of the instrument. 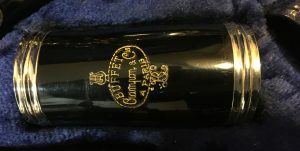 10 – picture of barrel with the emblem – a picture of a barrel will tell me practically nothing about the rest of the instrument. 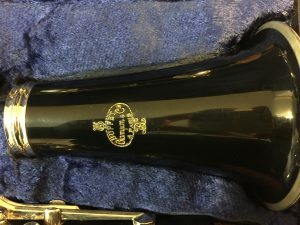 Just if it’s genuine with the rest of the instrument based on nuances of emblem design.